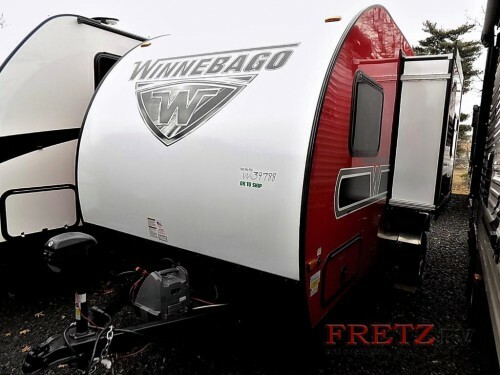 Check out the amazing Winnebago Minnie Drop teardrop trailers for sale here at Fretz RV! These unique and fun campers come in six floorplans to allow you to get exactly what you need for your family. Let’s a take look inside with this Minnie Drop teardrop trailer review and see how you can take your RVing life up a notch in both style and comfort. Travel with ease with our beautiful Winnebago Minnie Drop Teardrop Trailers! All of these Winnebago Minnie Drops are built to be in the lightweight classification of campers. This lightweight “teardrop” camper means that these can easily be towed. This plus the aerodynamic design will allow you to tow it with a small car such as an SUV or small truck. Plus, by not having to purchase a new truck specifically for towing and the better gas mileage you will get, you can have more money to put towards your travels! Find room for all you need in a compact and lightweight camper! One of the first things you will notice about these teardrop trailers is the amazing retro-inspired design of the exterior. With multiple colors including blue, orange, red, silver, and more, you can make sure that you get the exact look you want. And each option will come with one slide to keep the exterior compact while traveling but still giving you a spacious interior full of amenities. 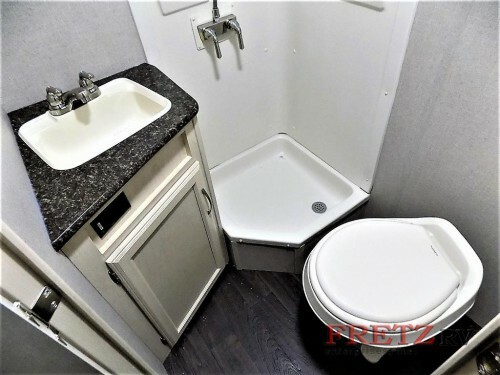 You’ll even have your own private bathroom! Speaking of interior amenities, you will be shocked at all of the amazing items that will fit inside this incredible RV. Find a full kitchen and full or combo wet bath to ensure that you have everything you need. 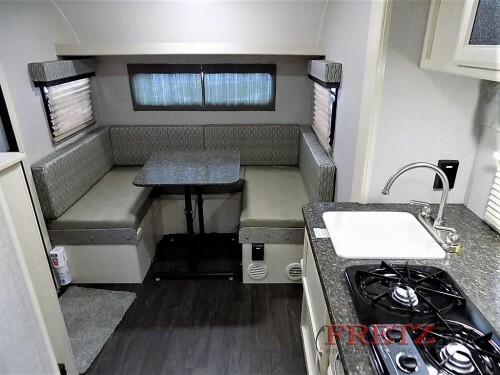 And with options of a queen bed or set of bunk beds and convertible dinette table, this camper can be the perfect getaway for a family of up to four people! There are so many things to love about our Winnebago Minnie Drop teardrop trailers, and everything together will equal one great camper. If you are ready to turn heads at the campground while increasing your comfort, contact us or stop by our location today!